@Maico hahaha you’re entirely too kind! By the way- are those MiG21 shots vanilla DCS or you use some Re-Shade graphical mods? These things fall under the you only live once category. Funny how every time I got hurt it was doing something mundane. i.e. Swimming with grandmas and kids, Im the only one to get stung by an iricangy jelly fish. I was in intensive care for 4 days after a nice UH-1 ride. Thanks Australia! In an FBO and saw this sign and thought of you @Maico! Blue skies with Ishak? Comrade, I am disappoint. 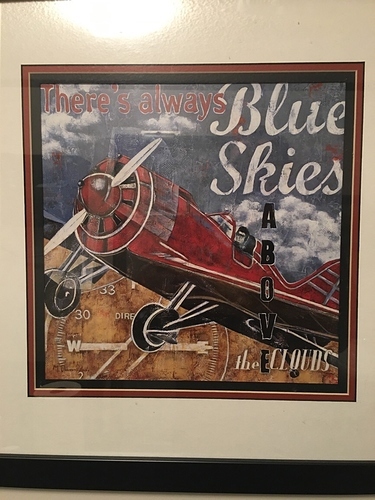 Glorious Soviet Red Skies in fly Ishak! Hahahaha Yes its nice above the clouds. I had to be realistic and start flying the mission at night w more noobish weather as in light clouds. But theres a bug in the mission and they turned off the runway lights as i was on final. Still nailed the landing but my body was pretty tense. Another attempt got me a flat. All in all really impressed w that ancient system. Back in the 60s they must have thought it was witchery! I should be ready for bad weather in a week or two. By the way, Fishbed has had noticible improvements in external model. It really looks the business. I been trying to get ILS in my hog and it aint working neither. Its broken perhaps? … and just now I got a working ILS on approach to Kobuleti. The ILS power button on the hog seems to be labelled backward. When I had it set to what seemed the ‘off’ position, and uncaged the needles, they popped up. Now they weren’t all that accurate until right before touchdown, so meh. 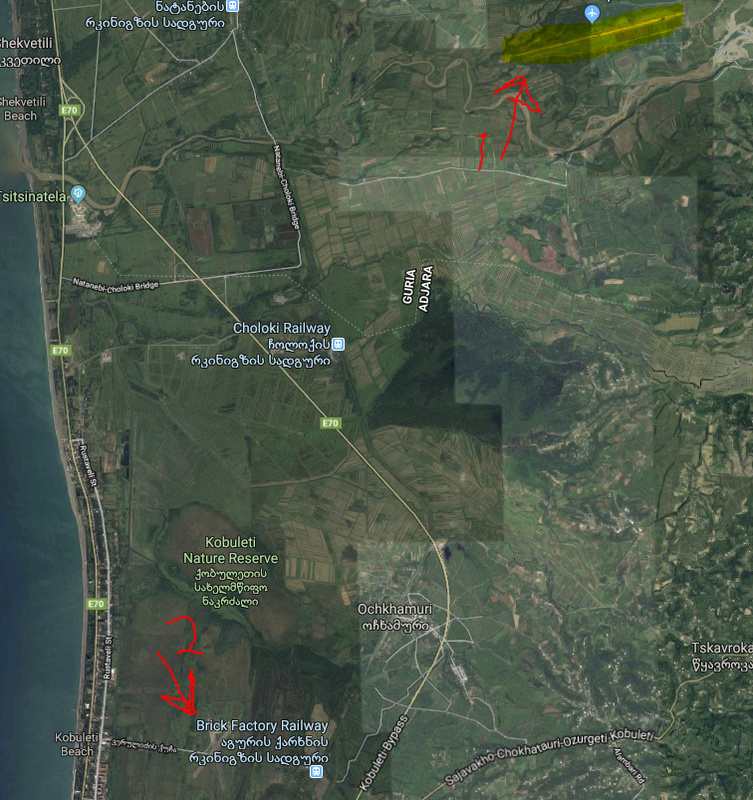 On another note, I looked at the airfield that we know and love in the sim as Kobuleti on google maps and it’s a decrepit ruin, realy no more than a trace of a former airbase. Funny that. And that imagery dates from ‘06, I wonder when it was closed. Kutaisi goes to ‘04 and looks okay. Senaki also dates to ‘04 and looks a bit run down. If you are going to put a target X on the ground, you should expect lower property values to follow! 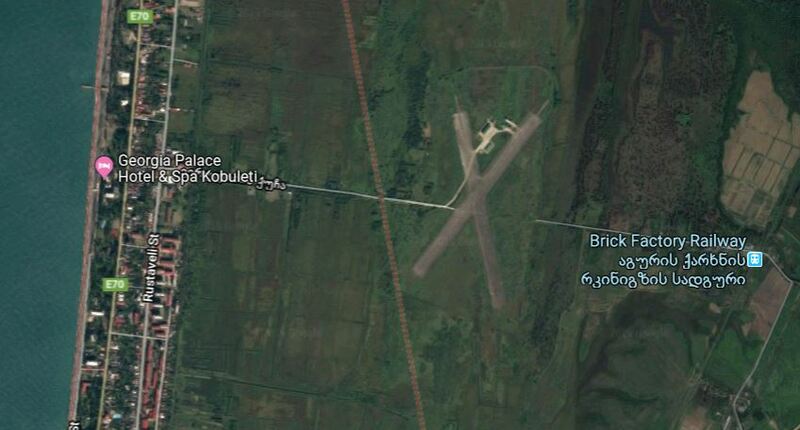 At my marking 2 is the X known IRL as kobuleti airfield. 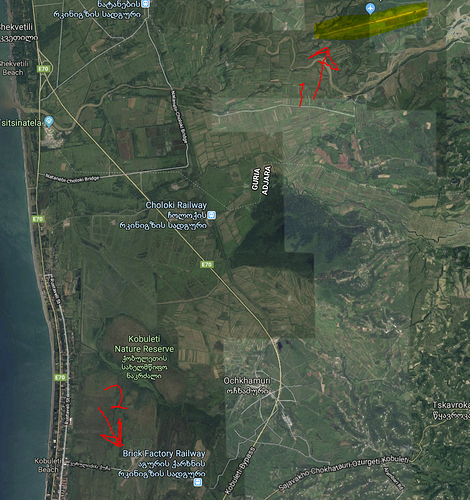 The (former) airfield at marking 1 (Meria IRL) is what is in the sim as Kobuleti. It is a ruin. All military air fields in Georgia were destroyed, the Russians bombed them in 2008. Some of them might have been repaired, but probably not, considering that Georgia is pretty much broke.